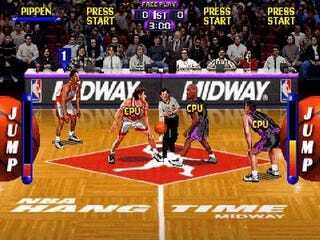 Reader Austin D. recently fired up his Nintendo 64 to play an entire season on NBA Hangtime. That's 34 games. Austin has no memory pak, so he had to play them all at once. That's more than 7 hours. Nonetheless, he triumphed against the CPU, with the difficulty set to maximum (Austin notes that Hangtime's AI was pretty cheap to begin with.) He picked the Utah Jazz, of course facing the Chicago Bulls (without Michael Jordan, thanks to licensing agreements at the time). Taking Chris Morris and Greg Ostertag against Luc Longley and Dennis Rodman, Austin built a 31-27 lead at the half. In the second half, Austin brought in John Stockton and Karl Malone, but instead of subbing in Scottie Pippen, the game chose Toni Kukoc. The Jazz triumphed 61-60, with John Stockton's three-pointer with 39 seconds left the deciding basket. You can read a more detailed recap here, if you like. Here are two video highlights and the boxscore. Enjoy! That beeping sound you hear is the forklift already loading the "Texas Rangers 2010 ALCS Champion" t-shirts on a freighter for Sierra Leone. After surrendering five runs in the eighth to lose to New York, you gotta think they're dead men walking. Game Two is on TBS at 4 p.m. Game One of the NLCS is at 7:30 tonight on Fox, followed by Game Two tomorrow at 8 p.m., same network. Just two pairings of ranked teams today - No. 12 Arkansas at No. 7 Auburn at 3:30 p.m. on CBS, then No. 1 Ohio State visits No. 18 Wisconsin on ESPN at 7. The last time the Badgers defeated a No, 1 team was in 1981. Other games to look for include Missouri at Texas A&M at noon and Cal at Southern Cal at 3:30, both on Fox Sports Net. No. 10 South Carolina is in the top 10 for the first time in forever and pulled off the biggest win in school history last week. That means the Gamecocks are due for a crappy loss, right about nowish. Defecating in the bed against Kentucky, in Lexington, would fit the bill. 6 p.m. on ESPN2. Of note: Ben Roethlisberger returns for Pittsburgh against 1-4 Cleveland (1 p.m., CBS); Kansas City and Houston (1 p.m., CBS) is an intriguing matchup of two strivers. Baltimore at New England (1 p.m. CBS) is the weekend's best pairing, hope that they're showing this in your market. If you live in the Bay Area, it's a good day to do chores outside. Oakland visits winless San Francisco (4 p.m., CBS), which begins its march toward guaranteeing Jed York's asshat declaration that the 49ers win the NFC West. The night game is Indianapolis at Washington, 8:20 on NBC. The Monday night game is Tennessee at Jacksonville, 8:30 p.m. on ESPN. UFC 120, from London, broadcasts on same-day tape on Spike at 8 p.m. The main event is a middleweight bout between Michael Bisping and Yoshihiro Akiyama. Jimmie Johnson has climbed back into the lead in the Chase for (his fifth consecutive) Cup. The Bank of America 500 runs at Charlotte Motor Speedway tonight, ABC at 7:30 p.m.